Jennifer is an experienced trainer of new family mediators, recognized by the Ontario Association for Family Mediation. 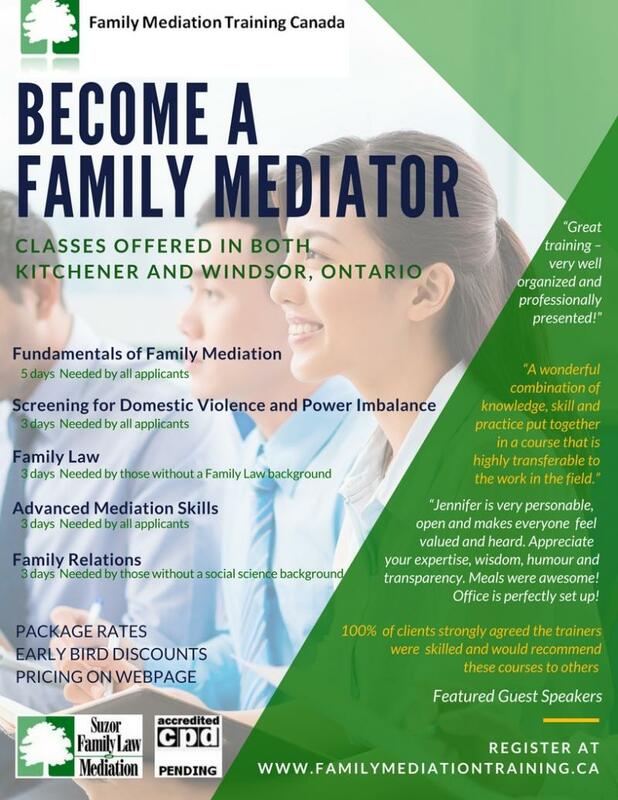 For more information on current courses, registration and for online payment options, please visit www.familymediationtraining.ca or call us at 519.252.2772. Courses are available in Kitchener, Ontario and Windsor, Ontario as well as any location where six (6) or more registrants are willing to take the courses. Courses can also be made available in certain specific topics such as an update on property law. Whether you would like to become a family mediator or not, these courses will enhance your knowledge of the process and would be of benefit to all individuals working with family conflict resolution. If you have any questions, don't hesitate to contact us at 519.252.2772.